Figure 1. Leaf litter basket locations. Carbon and water cycles in a forest ecosystem are highly dependent on the canopy structure and biomass. However there have been few studies that have quantified the dynamic relationship between biomass and atmospheric fluxes from tropical forest ecosystems. As National Forests in the Amazon region are increasingly opened to logging, the lack of information on the relationships between biomass and C cycling complicates our understanding of the potential impacts of these activities. This study measured the temporal dynamics of above-ground litter production in a primary forest, the Tapajos National Forest, before and after a selective harvest of commercial species. Above-ground litter productivity was measured in a 18 ha plot adjacent to the eddy flux tower at km 83, Tapajos National Forest, Para, Brazil. 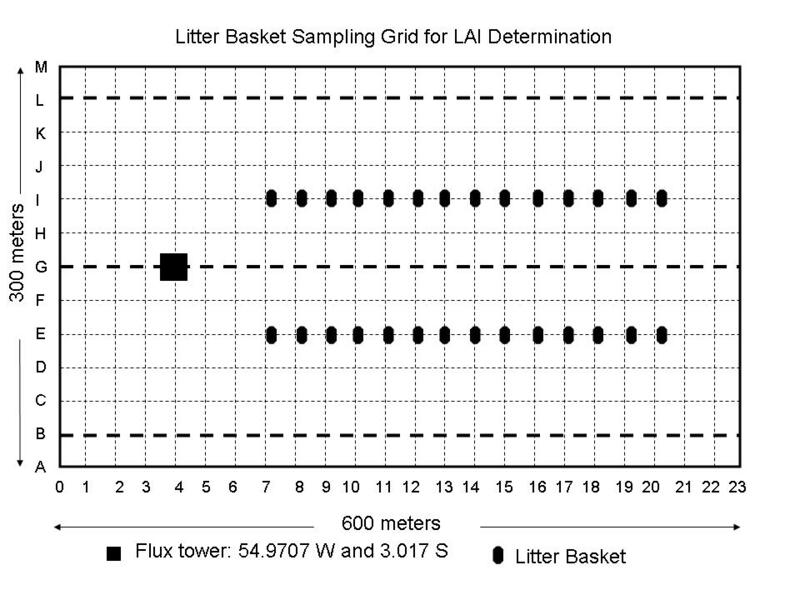 Thirty litter baskets distributed on two transects within the grid were visited bi-weekly. Oven dry mass of leaves, wood, reproductive parts and miscellaneous components of the collected litter was determined. Before the harvest (Sept 2000 through July 2001) mean annual litter production was 4.41 Mg C ha-1 compared to a mean value of 3.96 Mg C ha-1 after logging (Aug 2001- Aug 2002). These data suggest logging caused a reduction in litter productivity of approximately 10%. No further modifications to the data are anticipated. Litter productivity at the km 83 tower site in the Tapajos National Forest was measured bi-weekly between September 2000 and March 2003 and the mean values for the collections are reported in a single comma-delimited ASCII file: CD04_km83_litter.csv . 2 Day_cum "Days since January 1, 2000"
The data set covers the period 2000/09/01 to 2003/03/10. Seasonal patterns in litter quantity and composition are essential components of C cycle models. Comparison of pre- and post-harvest data allows for the quantification of the impact of selective harvesting on canopy size and productivity. Data have been reviewed and no problems found. A 18 ha plot adjacent to the eddy flux tower at km 83, Tapajos National Forest, was established in September 2000. Thirty litter baskets were located on two E-W transects within the grid. Each litter basket measured 1 m x 1 m and was supported 0.1 m above the ground. Baskets were visited bi-weekly starting in late September 2000 and litter collections followed Newbould (1970). Litter from each basket was air-dried at the LBA laboratory in Santarem, sorted into 4 categories (leaves, wood (< 2 cm diameter), reproductive parts and miscellaneous (material that could not be identified as well as insect bodies and frass). Each sub-sample was then oven dried at 50 degrees Celsius and weighed to determine mass. Data are available through the Oak Ridge National Laboratory (ORNL) Distributed Active Archive Center (DAAC).